Local volunteers operate the gift shop. The money raised from sales is used to purchase equipment and supplies for the hospital. 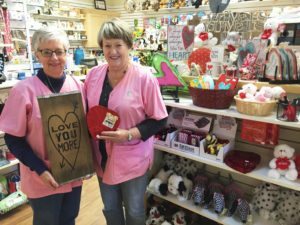 The gift shop has a wonderful atmosphere with a wide selection of gifts for all occasions. Monday-Friday 9:00 am – 7:00 pm. If you would like more information or if you have something specific in mind, we would like to hear from you.